All clocks are restored sympathetically, preserving the authenticity, to the highest standard. The clocks restored are treated with proper respect which comes from their many years of experience in the field. Their restoration service can cover all aspects – movements, dials and cases. 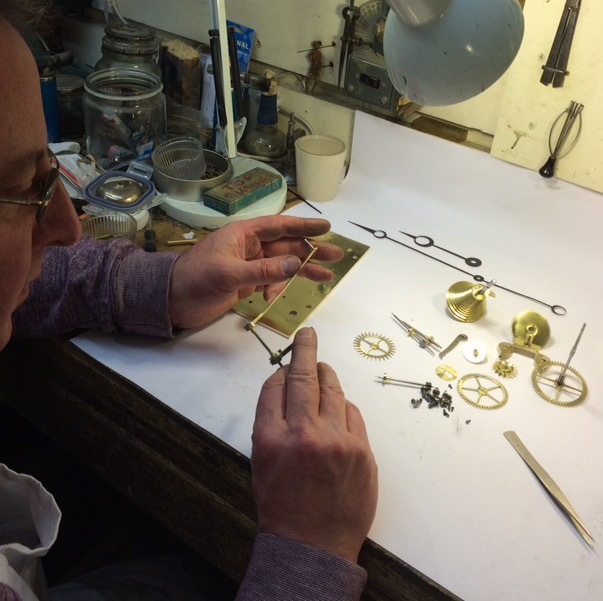 Most of the work is carried out in their workshop by Roger and James although some work on dials and cases is undertaken by their vetted and tested network of professional restorers. Movements are fully dismantled and cleaned, repaired where necessary, then re-assembled and fully tested. New wheels can be cut and fitted and any necessary replacement parts can be made to original pattern and specification. Dials can be re silvered using traditional methods, brass work and spandrels cleaned and polished, then the whole dial lacquered to preserve the finish. Numerals can be re-waxed or re-painted if necessary. Painted dials can be re-touched or fully restored depending on condition, and faded or rubbed numerals replaced where the originals can be traced. Casework ranges from a light sympathetic polish and re-wax to a complete re-build. We can also deal with painted finishes e.g. English lacquer work (chinoiserie).